The amazons and flipkarts are the google of shopping in India. They have commoditized the whole ecommerce market, hence irrespective of specialized sites available, whatever you want or you don’t want is available on amazon. And to top it up is the restriction on FDI in ecommerce that adds to their advantage. Well why this restriction! Nobody knows better than the government and the corporates lobbying for it, but for now we got to live with it. With their Walmart like (marketplace) business models everything in Indian ecommerce today boils down to the price. But is that truly so! A lot is left to explore here, well yes the new and growing aspirational middle class of India is still price sensitive but that does not mean we are not up for quality, luxury and Disney like experience in shopping. The Walmart like model is not all that works for Indian e-consumer. We will have to look at the Indian consumer from multiple lenses and present a consumer centric as well as feasible view of demand structure of this Indian market. What we truly need is a little less of Walmart and little more of Disney like experience in the Indian ecommerce. There is an uncontested market space of consumers which is the new upper middle class and the new middle class. These guys have the purchasing power and are ready to pay for experience with the product. They are looking for luxury products, have reasonably good affordability, have travelled the world and acquired the taste for international brands. That is where companies like freshmenu.com are cashing in. When every one was talking about affordable food at your doorsteps.Freshmenu.com brought in international cuisine and palatable food to your doorstep. It is for you to take the strategic perspective on this market if it is ready for you with Disney+walmart approach or should I wait for it to become suave and richer for my global strategy. 1.Brand’s Culture and promotion: With the new found freedom and approach to using money Indian upper middle and middle class are spending money to become part of elite groups which they can recognise with. Harley Davidson’s (HOGS) type of groups , the real estate sales on invitation for selected few are some of the examples. Hence it becomes vital to communicate and project the brand as a culture and membership of that culture should be a matter of exclusivity. 2.This also makes some other components of strategy canvas obvious which include exclusivity, niche clubs and customisation. 3.Occasion specificity: India is a land of festivities and each festival has its own dynamics as well as geographical significance. Amalgamating this with the closely knitted family system as well as western influence of newer range of celebrations like father’s day, mother’s day, earth day, valentine’s day, friendship day and the host of other celebrations makes the whole situation quite complex. Festivals are the major shopping time and the almost year round celebrations make the market interesting for the retailers. This calls for occasion specific preparation on customising and marketing the products around the celebrations. For e.g. friendship day has a friendship band while “rakshabandhan” has a similar concept but dedicated to brother sister relationship. Friendship day may not call for expensive gifts but rakhsabandhan calls for most exclusive gifts going from brothers to their sisters. I mean can you imagine my sister asked for an Armani watch as a rakhsabandhan gift. Now I am browsing Armani’s online store to gift her something which is of course Armani but also has statement of the bond shared. 4.Above the Line Marketing: Though Indians are internet and mobile savvy but their first love is still television. Their reading habits are evolving but they still love visuals and sounds. To build trust and reputation as a brand in here, a combination of digital marketing with heavy doze of traditional ATL channels of promotion is the key. 5.The EMI option: Another twist to the tale is I may want to gift Armani watch to make my sister but I also want to have a non disruptive month. So I need an easy monthly installment scheme from you. We Indians love easy monthly instalments schemes. 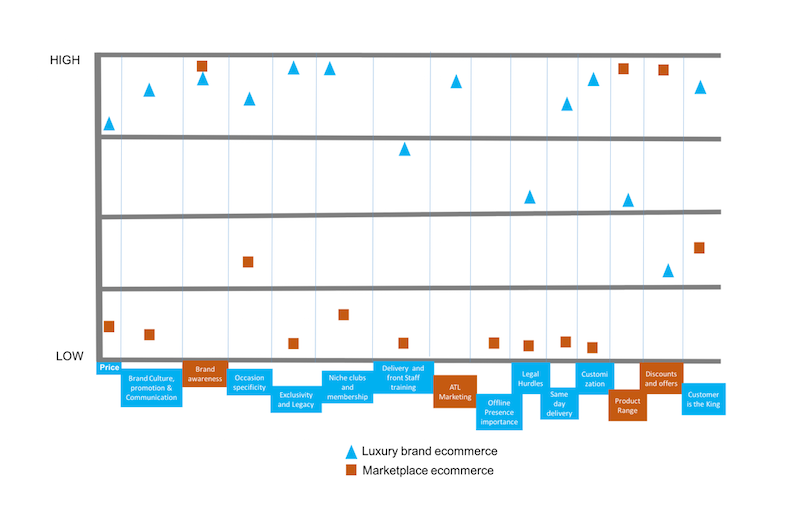 6.Same day delivery: The advantage that luxury brands can have over the marketplaces is that their major market is concentrated in the metropolitan and cosmopolitan cities. This should make it easy for them to meet this same day delivery requests which otherwise is a major challenge for marketplaces in a large country with weak transport network. 7.The delivery guy: When the marketplaces in India started out the quality of delivery guy was exceptional. They were aware of the policies, schemes and return mechanisms, left a nice note when you were not available at home, spoke well over the phone and were well dressed. But overtime the quality and I guess it is attributed to high attrition and pressure of reducing cost, today most of the delivery guys seem to be untrained on customer service, delivery etiquettes and basic professionalism. Nothing against them but I believe that delivery guy is one of the few human touch points in ecommerce and is definitely your brand ambassador who can create a delightful experience for the shopper. And when it comes to a luxury brand the experience matters the most while rest is hygiene. Hope some of these points add value to your understanding of Indian e consumers. This was our first attempt at blogging our thoughts and we welcome your feedback and suggestions. Let us continue the discussion on the canvas in the next few articles. We are now working on understanding the fundamental problems in entering the Indian ecommerce market. Hopefully will come back with some insights soon. 2.W. Chan Kim and Renee Mauborgne. 2005. “Blue Ocean strategy”. Harvard business school press. 3.ITunes Podcast: New rainmaker. How the integration of content and commerce creates winning difference.